Hazy and golden in color, this brew is a fresh twist on the popular Hefeweizen style. Eureka and Lisbon lemons, from three growing regions in California, balance out the wheat malt character, resulting in a crisp and refreshing wheat ale with subtle lemon flavor. Cheers! I don’t even remember buying this one but it ended up in my spring cleaning of the bier cabinet. I had the Blue Moon, Honey Moon earlier and thought I would stay with the wheat’s and do the Sam Adams. I’m generally not a big fan of Sam Adams but I will keep and open mind. The beer pours a pale golden straw color with a white head. The beer is slightly cloudy but not your typical wheat beer unfiltered cloudiness. There does seem to be a lot of carbonation with a lot of tiny bubbles rising up from the bottom of the glass. There is not a lot on the nose. There is a very light malt presence with some citrus and clove notes. The head has just about disappeared and I haven’t even gotten to the first sip. Boy, I don’t know what Sam Adams is thinking about with this one. “a fresh twist on the popular Hefeweizen style”; this is a far cry from a Hefeweizen so it’s a pretty big twist. OK, here’s the play by play. The taste starts out with sweet wheat malts up front on the tip of the tongue then a nice effervescence over the tongue but the effervescence is not cleansing or refreshing because there is a building sweet citrus taste along with it in mid-sip. Usually something like citrus flavors are not realized until the back-end and finish. The back-end is even more confusing. There is something odd that makes this beer hard to swallow. That may be harsh, (pun intended) but it is not as easy drinking as you would expect. The finish is not bad but once again it is not refreshing either. There is another odd almost metallic taste in the finish and in the final aftertaste of this beer. This is just not a clean or refreshing summer beer. It’s not necessarily bad but it certainly is not good either. I keep taking another sip hoping that it will be better then the last but it’s not. Isn’t that a definition of insanity; doing the same thing over and over again expecting a different result. I guess I’ve just bought into the Samuel Adams hype and expected a real craft beer here. This is now at 67 degrees and I’m not letting it warm any further. The oddities are now turning down right unpleasant. I actually just got a shiver from drinking that last sip. I may have to put Sam Adams in the same category as Michelob for suckering me into trying their beers. The good news for you is: If I try them then you don’t have to. The best I can do for a rating on this one is a D.
Sorry Folks I cannot recommend this beer to anyone. Even if you consider this an American Pale Wheat (which it is) and forget their Hefeweizen twist reference it still is not a good beer. The bottom line is that this is not a refreshing beer and it has some very unpleasant notes. If you are looking for a real refreshing summer wheat ale do yourself a flavor and pour a Blue Moon Honey Moon. 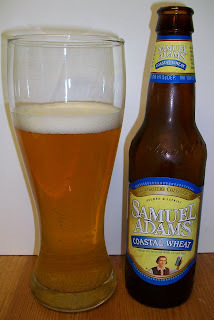 This Samuel Adams Coastal Wheat is a Craft Beer without the Craft. Sounds like your scraping the bottom of the barrel. That was my thought before I read the review. But it seemed like you came to that conclusion on your own. NeVER mind. Hey Missy, Not quite the bottom but pretty darn close. I'm going to have to agree with you on this one. I tried this beer a few weeks ago and was unimpressed. Yeah, you would expect something better from Sam Adams. Thanks for the comment, now don't be strange.